As relayed by AppleInsider, Ticonderoga Securities analyst Brian White has issued a new research note discussing the possibility of Apple releasing a "Smart TV" as soon as later this year. White's speculation comes from "data points" picked up at a Chinese electronics trade show being held this week. "Our research suggests this Smart TV would go well beyond the miniature $99 second-generation Apple TV that the company released last fall and provide a full-blown TV product for consumers," White said. He went on to say that although Apple has long been projected by company watchers to enter the HDTV market, the Mac maker now appears to be "moving down this pace at a faster pace than the market expected." 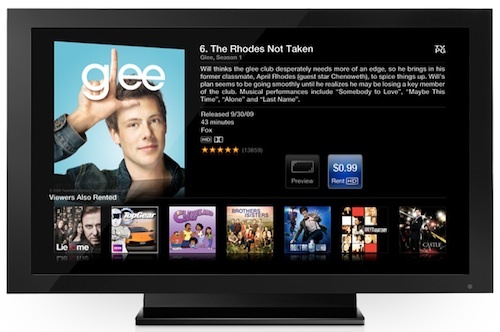 Piper Jaffray analyst Gene Munster has been the most vocal proponent of the idea of an Apple-branded television set integrating iTunes-focused video subscription services, but even Munster has typically seen such a release happening a bit further down the road than pegged in White's new claims. Apple executives have said in the past that the company has no interest in the television market given slim profit margins and an already-crowded field, but Munster has remained steadfast in his belief that Apple does have plans for this market, and White now appears to be joining him.